Today is the second anniversary of the 9/11 attacks. What should that mean to us? 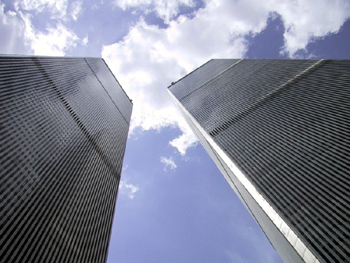 For me, the chief lesson of 9/11 is the simultaneous power and impotence of government. 9/11 vividly demonstrated how powerless government is to protect us and make us safe. The United States government is the most powerful organisation that has ever existed in human history. It possesses untold wealth, unmatched military might, and a globe-spanning spy network. And in a few short hours, a handful of murderous fanatics armed with nothing more impressive than boxcutters were able to inflict a series of devastating attacks against which this almighty government was helpless. Our rulers talk blithely about preventing future attacks, but the truth is they haven't got a clue how to do it. If some nut wants to inflict a lot of damage and is willing to sacrifice his life to do it, there's very little that the government can do about it. The 9/11 attacks exposed the protective nation-state as the fraud it is. But if the government lacks much power to protect, 9/11 also showed how much power it does possess to do harm: To pursue the arrogant foreign policy that invited the attacks in the first place. To ensure that no one on board the hijacked planes was carrying weapons that could have been used against the hijackers. To respond to the attacks by stepping up the assault on civil liberties at home. To respond to the attacks by raining down death and destruction on innocent civilians in Afghanistan and Iraq, thus ensuring that even more American citizens will be targets for retaliation for the next fifty years. A form of social organization whose power to do evil is enormous while its power to do good is minuscule is a form of social organization that needs to be mothballed. Today is the second anniversary of the 9/11 attacks, but it is also the first anniversary of this blog, and of the Molinari Institute. A year ago today, in my very first blog entry, I argued that the 9/11 attacks had made the task of abolishing the State increasingly urgent, and I announced the formation of a policy institute dedicated specifically to that goal. Named after Gustave de Molinari (the first market anarchist) and dedicated to his intellectual legacy, the Molinari Institute makes market anarchism (rather than libertarianism more broadly) its central focus. Over a century and a half ago ago, Molinari wrote: 'one day societies will be established to agitate for the freedom of government [his term for market anarchism], as they have already been established on behalf of the freedom of commerce.' For a report on the Institute's recent activities, see our new News & Announcements page. And join us in building a stateless future. Roderick T. Long is Associate Professor of Philosophy at Auburn University; President of the Molinari Institute; Editor of the Libertarian Nation Foundation newsletter Formulations; and an Adjunct Scholar of the Ludwig von Mises Institute. He received his Ph.D. from Cornell in 1992. His last book was Reason and Value: Aristotle versus Rand; his next book will be Wittgenstein, Austrian Economics, and the Logic of Action. He maintains a blog on his website, Praxeology.net.